National Weather Service forecasters out of the Caribou office expect a gradual warm-up for February. The County has seen its share of snow, with January earning second place for the snowiest month on record. The Caribou Public Works Department uses several tons of salt annually on the busier roads in the city, such as Herschel Street, pictured here in early January. 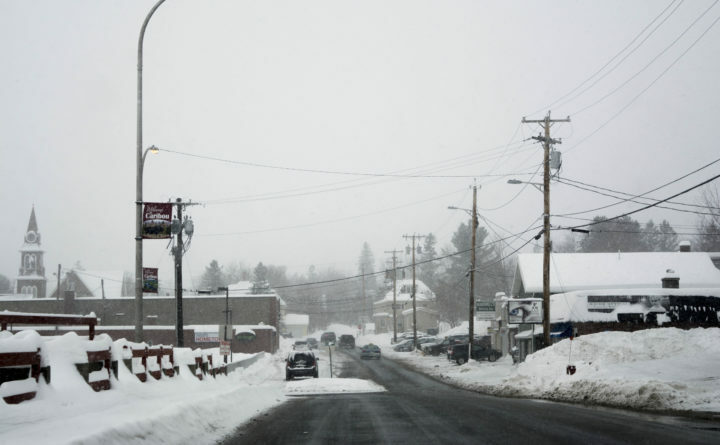 “It has certainly been a winter to remember, as far as snowfall in Caribou,” Walker said. Due to a lack of contract observers in the Houlton and Frenchville areas, information about snow totals there is not available, according to the weather service. Suffice to say that all of Aroostook has seen substantial snow thus far. Walker said he couldn’t say exactly what has contributed to the excessive snowfall this year, and he would not attribute it to climate change. “It is above normal, but it is not the most snow we have ever gotten in a season,” he said. According to Walker, the most snowfall ever seen during any winter season was 197.8 inches, which occurred during the winter of 2007-08. “Despite that, I doubt that we will break the record for total snowfall set in 2008,” he said.